I received this Handsome Fella from a image swap recently. It's okay card, I guess today wasn't my day craft wise. There is nothing fancy about the card. The pattern paper is by Pebbles Inc. BBQ Words. 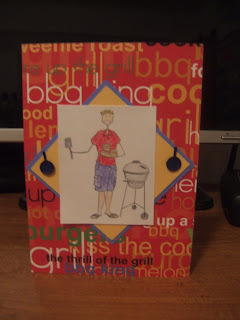 I used the blue cardstock to match his shorts and the they mustardy color to pull the words out of the pattern paper. The frying pan brads are from an embellishment swap that I received awhile back. I have more of this image I'll have to play with it and do a different style with it. I am so glad you played along with our FFF challenge. Your cards are so cute! I think this is very cute! I love the background paper and I think you did a great job of not letting the busyness of the paper overwhelm your card! I really, really like it alot!! Just heard from Kimmy that you participated twice in our FFF challenge! Thanks so much for playing along--Nice job with Bella & Fella!